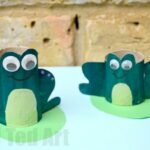 Soooo, yes, we do have little spurts of activity and craftiness.. and often one theme sparks another.. you may have noticed a few TP Roll Crafts popping up on Red Ted Art these last few days.. well, if you know us, you know how much we LOVE craft with Loo Rolls! So much so, we have a WHOLE CATEGORY dedicated to them! 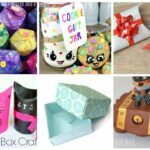 Do also peak at our DIY Gift Boxes. We are also in a point of our crafting lives, where practically the whole family (including Opapa in Austria), finds it difficult to throw away a TP Roll. Hahahaha. 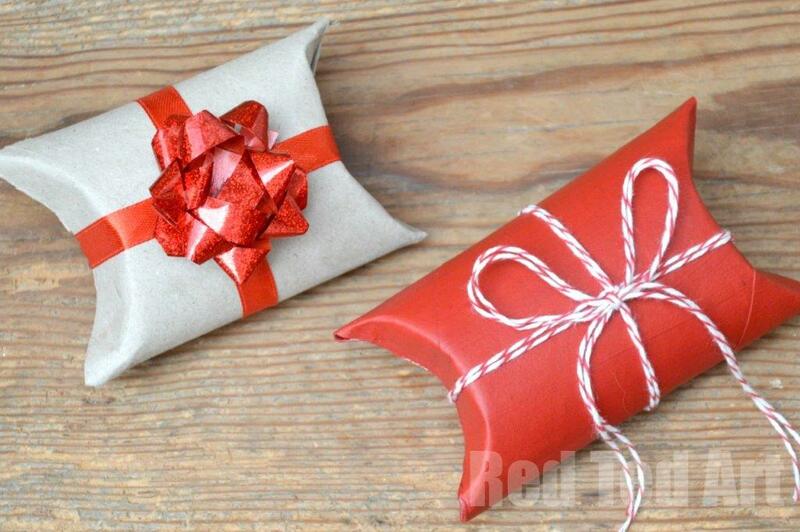 Anyway, today, we have super simple and quick to make TP Roll Crafts – these adorable little TP Roll Gift Boxes in TWO different design.. one I like to call the “classic TP Roll Gift Box” (the red one) and the other is the “Tetra TP Roll Gift Box” (the shiny ones). 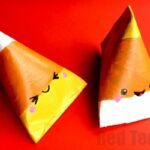 Both Gift Box ideas are REALLY easy to make. 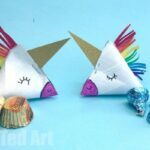 So they are brilliant as little “favour bags” at a party, you can fill them with confetti for New Year’s Eve or a wedding or of course use them as gift boxes at Christmas or Birthdays – be it to give “cash” or gift cards, or for small presents (diamond ring? Yes please!). 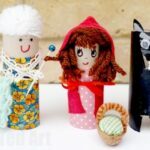 Note: I know some people are not so keen on TP Rolls – you can make all these crafts using Kitchen Towel Tubes cut in half too.. perfect if you are filling your “TP Roll” gift box with sweets and treats! 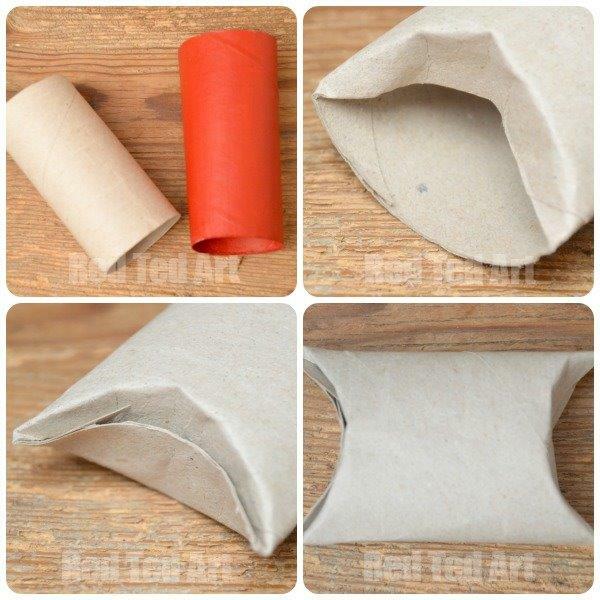 The basic box is easy….. take one end of your TP Roll and gently press the centre point in – to get a kind of curved effect. Then repeat on the opposing side, and let the flap you create overlap. Repeat at the other end and done! Then decorate to your hearts content. We kept it super simple here. But I think simple works really well! Like the first gift box, you can make these as simple or as “complicated as you like”. We painted them in bright metallic colours first (I used acrylic paint). Paint them the day before you need to fill them! 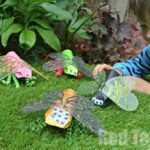 Alternatively, you can leave them plain, and again decorate with stickers and washi tape and ribbons. 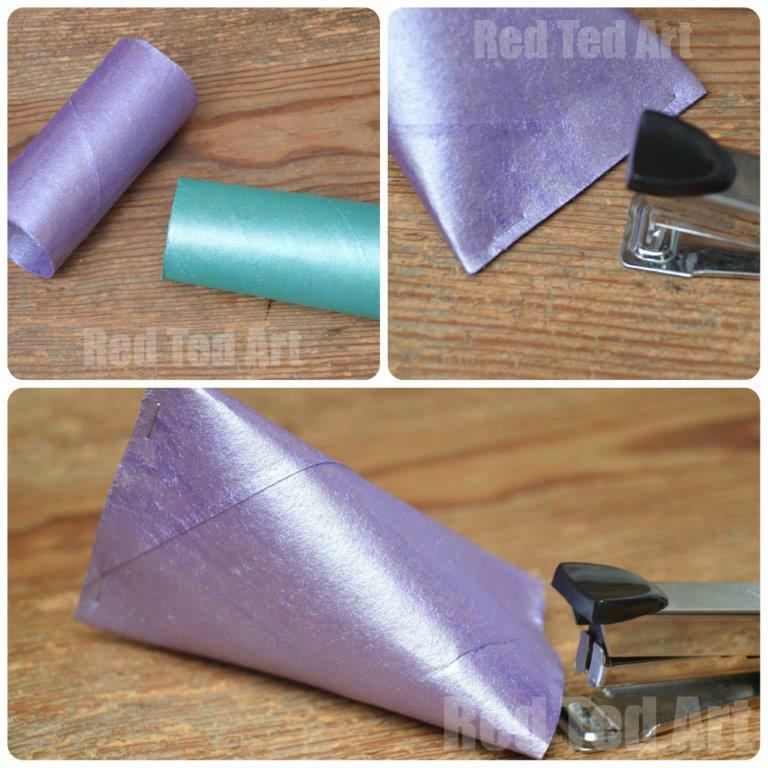 Also, here we used a stapler, but you can also “make” your box using tape or washi tape, instead. To make your box – take one end and “flatten” it, bringing the sides together to from one straight edge. Staple in place. Now turn your cardboard tube bu 90 degrees, flatten again, and staple again. 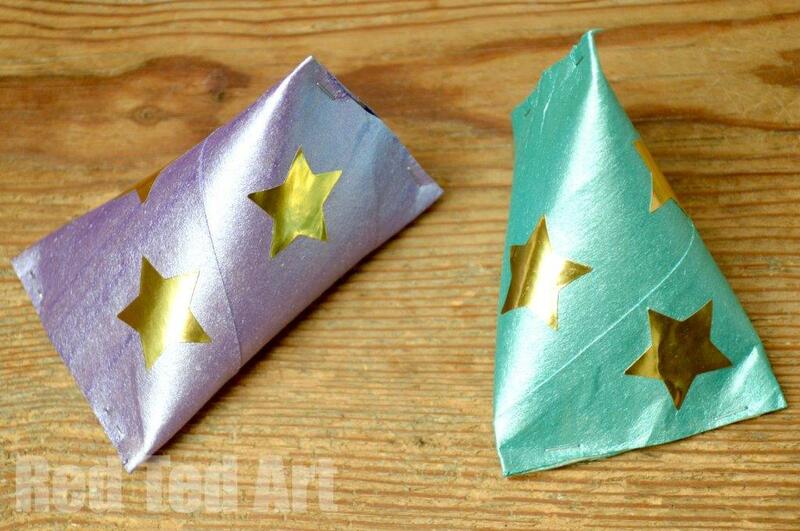 This gives you that nice pyramid shape to your Gift box. Then decorate to your hearts content. 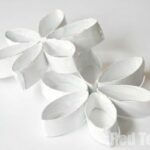 I think these work really well for holding confetti or as little “party favours”. 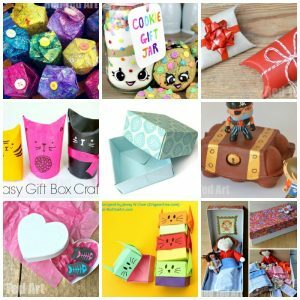 Want more Gift Box Crafts? Really Both the above ideas are superb and easy to make. 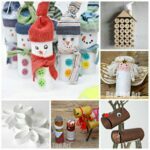 I will Surely going to follow these ideas this Christmas to gift my close friends. Sooooo good. I love the first ones but I actually made some out of normal corigate cardboard and made a tube like that!! 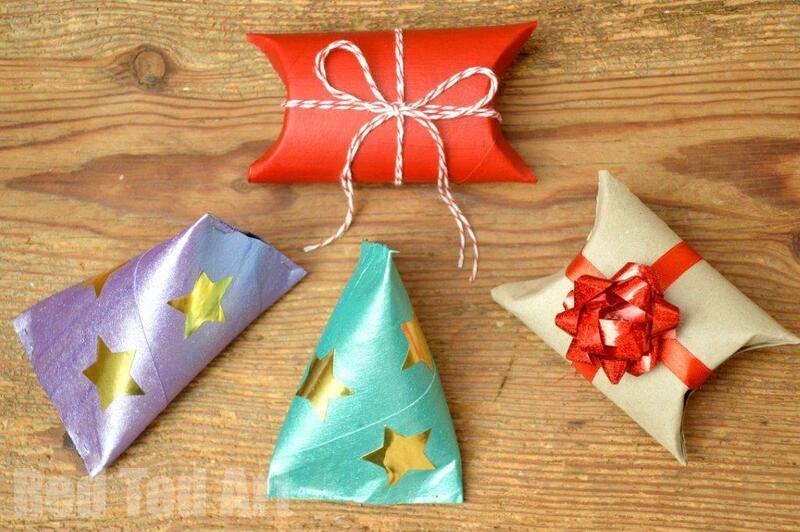 These are very innovative ideas for gift packaging. Thanks for sharing nice post.